Leftover food is very common in every household. Not many people like eating leftover food especially in the same form, but at the same time, you cannot just throw away food. Give the leftover food a little twist to make it interesting to eat. • In a large pan, heat oil and sauté flour till it turns brown. • Add tomato puree and onions. Cook for 15 minutes while stirring occasionally. • Add rice, vegetables, salt and pepper and cook for 5-10 minutes. • In a small bowl, mix oil, salt, pepper, sugar and herbs. Stir till sugar dissolves. 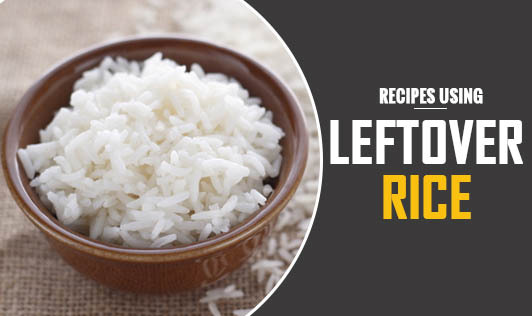 • Pour this mixture to a large bowl containing rice. • Add the remaining ingredients, toss well and serve. • Combine all the ingredients, except 1 cup of milk, in a non-stick saucepan. • Let it cook till it starts becoming dry. • Add 1 cup of milk and let it boil. • Serve chilled garnished with dry fruits and nuts.